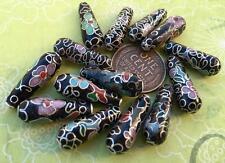 These Cabochons Are Great For Stain Glass Mosaic Glass Fusing Supplies. Cabochons Are Over 60 Years Old So There Are Imperfections Such As Rough Edges Or Slight Scratches. Picture Shows a Good Representation of the Colors, Shapes and Sizes in the Mix. Vintage 12mm frosted painted floral raised glass cabs from Western Germany. 3mm in thickness. You will receive 6 pieces. Vintage 10 x 15mm stackable enameled metal petaled beads/findings mix. You will receive 2 of each color for a total of 14 pieces. These are a beautiful mix of old stock Czech pressed glass flower and leaf beads. The sizes range from 5 to 17mm. You will receive a random mix of 50 pieces. Shapes can include round, teardrop, rondelle, oval, square tube and more. Each bag is different. Designs can include opaque, transparent, translucent, glitter and foil lining. 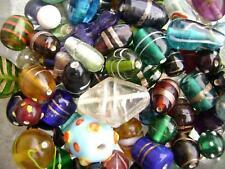 Bead mix, lampworked glass, multicolored, 3mm-20mm mixed shape and pattern. Antique Silver, Mixed Color. We also can source many products for you. Jewelry Beads. 8~9mm thick, hole: 5mm. we will solve your problems in 48 hours! Size: about 12mm long, 13mm wide. Product View. The sapphire crystal is faceted and has a very Victorian look. The top of the pendant has a dripped hole. Size: 20mm long. These are very old and fun beads to create with. Vintage plastic fruit charms mix from West Germany. The average size is about 12mm. You will get a random mix of 30 pieces. Vintage purple glass drop beads/charms with an embedded brass loop. The size and shape varies from bead to bead but averages 7 x 15mm. 18 pieces. Vintage 2 x 11mm marbled purple mother of pearl lentil beads. 20 pieces. 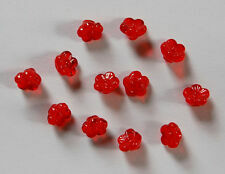 Vintage 15 x 30mm glass seed bead wrapped strawberry charms. There is a silver tone jumpring and green plastic leaf charm at the top. 3 pieces. (Gauge / Thickness). COLOR: SILVER & ROSE. MATERIAL: SILVER PLATED BRASS & GLASS. AGE & ORIGIN: 1960'S TO 1970'S. GREAT FOR CRAFTING, DESIGNING OR COLLECTING. Vintage plated brass earwires with safety back, loop and faux pearl. Nice clean condition. You will receive 10 pieces (5 pair). They are genuine lead crystal, beautifully cut and sparkle like crazy. Theses sparkly beads do NOT have an AB finish. Color: Aquamarine Blue. Shape: Faceted Round. These beads are old but they are in good, unused condition. 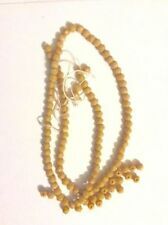 Vintage 5mm yellow and white plastic flower beads from Western Germany. The hole is drilled from side to side across the center of the flower. You will receive 40 pieces. 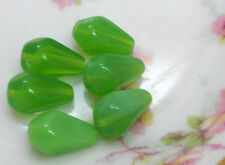 Vintage 9 x 9mm flat backed faceted green glass foil backed cabs/stones. You will receive 30 pieces. 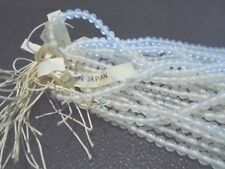 Vintage 8mm dimpled glass bead chain from Japan. The metal loops are brass. The glass has a slight purple tint. You will receive an 18 inch length which has 36 - 38 beads. Vintage 8 x 9 green enameled metal heart cabs/findings. 20 pieces. Vintage Royal Blue Millefiori Beads 12mm Japanese 16 Pcs. They were made in the millefiori style and are a lovely rich royal blue base bead which has been studded with multicolor canes. These beads are handmade so size and shape will vary. These 1960s - 70s Japanese millefiori beads are a classic! And in MINT uncirculated condition. It is prohibited by law. Vintage 10 x 13mm translucent lavender glass incised scarab cabs. Both sides have an incised design. 12 pieces. 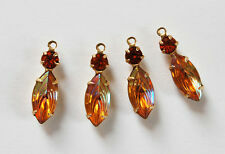 Vintage Czech opaque orange pressed glass leaf beads. The hole is drilled from side to side across the top of the bead. 20 pieces. Vintage slightly aged brass tube beads from Japan. 1.5 x 12mm. You will receive 100 pieces. Vintage triple brass chain lengths/findings. There is a small 4mm aged silver/grey jumpring at both ends. One of the three chain lengths is slightly shorter than the others, making a lovely graduation when the 2 jumprings are brought up. You will receive 12 of these triple lengths. SMOOTH ROUND BEADS 4571. SIZE & SHAPE: ROUND 8mm. BEADS FINDINGS AND MORE BY JOHNV6. AGE& ORIGIN: LATE 1960'S TO EARLY 1970'S. QUANTITY: 50 PIECES. EACH HANDMADE BEAD IS UNIQUE AND MAY VARY IN SIZE & COLOR SLIGHTLY. Vintage 14mm moss green intaglio glass cameo cabs. 3mm in thickness. 8 pieces. They have a drilled hole only at the top with an embedded brass loop. The glass is solid and has a very art deco look. 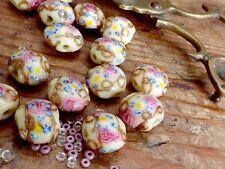 These are very old and fun beads to create with. Size: 13mm long 6mm wide. They're set in brass. If you like old beads & findings, etc. Here's 2 gorgeous pendants, so pretty. Vintage portrait limoges glass cabs mix. 12 x 17mm and 18 x 25mm. You will receive the 5 pieces shown. Vintage translucent light purple glass bead charms with an embedded brass loop. 8 x 11mm. You will receive 18 pieces. Glass alone is about 19x11mm, the rest is headpin length. Headpin and leafy bead cap are raw brass. They have a drilled hole only at the top with an embedded brass loop. These are very old and fun beads to create with. Material: glass. These beads are a piece of art and each one was hand made. They were made in Japan many years ago. Vintage large rich pink lucite hoop beads from Japan. There is a vertically drilled hole at the top of the hoop. 26 x 39mm. Nice quality. 6 pieces. Vintage large gold tone metal Saturn planet charms/pendants. 21 x 32mm by 14mm in thickness. Nice quality and weight. 2 pieces. Vintage Asian enameled metal floral charms pendants with 2 loops. The backs are slightly aged gold tone metal. 17 x 33mm. 4 pieces. Vintage 9mm incised slightly aged brass reflective starburst hexagon cabs/findings. You will receive 20 pieces. Very vintage aged copper metal filigree leaf findings from Japan. The tone of the metal varies slightly from piece to piece. 7 x 30mm. You can use a plier to loop the stem if you please. You will receive 16 pieces. 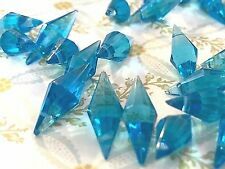 Vintage 10 x 14mm crystal AB look plastic flower beads from Austria. The whole is drilled through the length of the bead. You will receive 16 pieces. Vintage warm iridescent rectangular glass beads. The size and shape varies slightly from piece to piece but averages 5 x 7mm. You will receive 30 pieces. 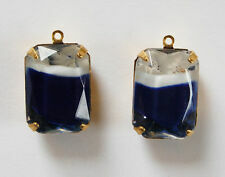 Vintage blue glass rough hewn drop beads/charms with an embedded brass loop. The size and shape varies slightly from bead to bead but averages 7 x 16mm. 18 pieces. These are HAND made and each a little unique piece of art work! They are a 12mm round. As you can see from my pictures, these beads are very detailed. Quality made. These beads are all in unused escellent condition. 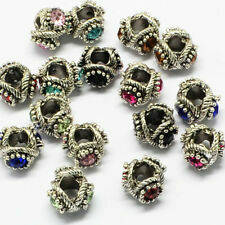 (SMOOTH LARGE HOLE BEADS N489. MATERIAL: GENUINE TURQUOISE MATRIX. COLOR: TURQUOISE MATRIX. SIZE & SHAPE: ROUND 10mm. Thickness Hole to Hole) APPROX. BEADS FINDINGS AND MORE BY JOHNV6. AGE & ORIGIN: 1970'S TO 1980'S. Vintage 10 x 15mm wooden bird charms/connector beads with embedded brass loops. 12 pieces.